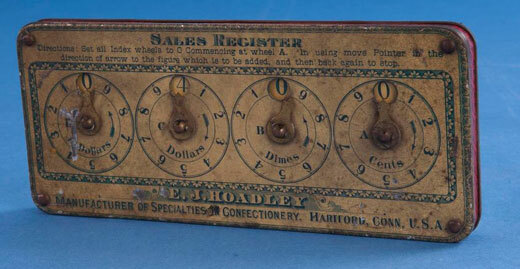 The device (see the upper image) was produced and distributed under the name Sales Register by E. J. Hoadley, Hartford, Conn, a manufacturer of specialties in confectionery. It was a tin and brass device with overall measurement: 2.2 cm x 17.8 cm x 7.6 cm. The device has a tin case painted yellow and green on top and red around the edge. 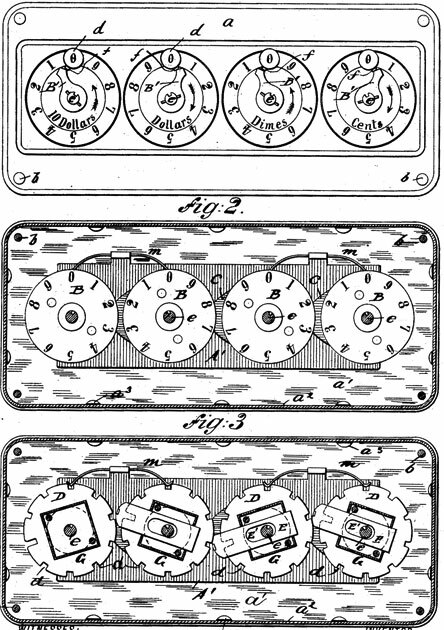 The top of the case has four wheels drawn on it, each of which has the digits from 1 to 9 drawn around the edge. The digits go clockwise for the first and third circles (marked Cents and Dollars and counterclockwise for the second and fourth circles (marked Dimes and Dollars). At the top of circles, at the zero position, is a window that reveals a rotating disc below. The discs are rotated using thumbscrews that protrude from the back of the instrument (see the upper image). An arm on top of each circle points to a digit on the wheel. The discs advance when they are rotated in the direction of increasing digits and remain fixed when the arrows are moved back to zero.